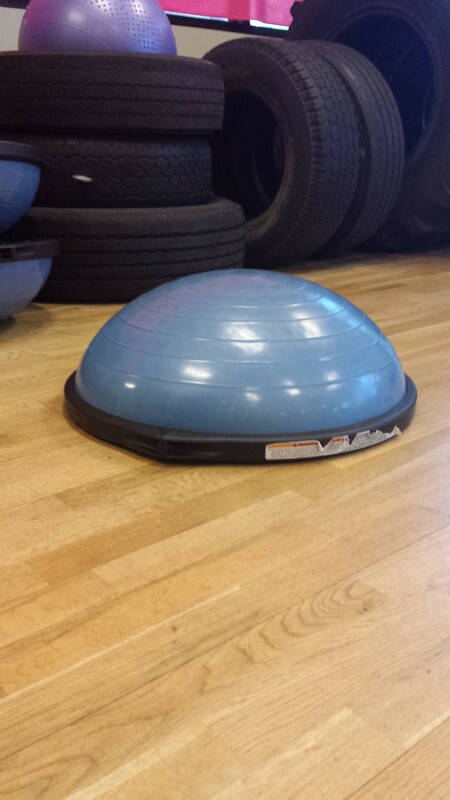 At my gym there is this piece of equipment called a Bosu; a large half ball-half round platform that you balance on when you are performing different exercises. You can stand on the ball portion with the flat side down and as you stabilize your feet do exercise such as squats. You have to engage your core, arms, legs, and feet to remain on the ball. This exercise can be tough for me because if I am not centered and balanced, I will fall off. The same occurs in life; when I am not balanced, I fall down (metaphorically). I have found I need to have a list of strategies that get me back in balance as soon as possible. I am challenging myself to come up with a list of 100 that I can use to help reset my balance. The starting spot is to notice I am out of balance. I find that checking in with myself through a quick deep breath is one way to notice. Another way to notice if I am out of balance is to look for some signs – sad, mad, tired, and anxious feelings are signs that I am off balance. Journaling- I have a journal that I write in as I need. I find it is a place to put my feelings, thoughts and stuff in my head I really want to get rid of. I write as a brain dump and I get clarity and focus afterwards. List 5 things I am grateful for from my day- nightly as I am laying my head on the pillow, I review the day and think to myself what happened that I am grateful for. I have to come up with at least 5 items. Usually it is much more than 5. Exercise/Movement- I like to walk, workout at the gym (I go 3-4x a week without fail), hike, swim. This is a great stabilizer. Eat more veggies- when I feel out of balance, I look to my food and see what is off. I find increasing my veggies makes my body feel good. Meditation- I have been consistently sitting quietly for 5-10 minutes daily for the past few weeks and finding that it is such a wonderful way to recharge and balance. I know everyone has a hectic schedule, but I carve out 5-10 minutes at some point in my day. A friend reminded me to make it as an appointment in my calendar. My list will not be your list, but you might find you like some of my tactics for yourself. Once you have your list, use them. When you are struggling emotionally, struggling with food, give them a try. I like to complete one a day to keep myself in balance. I think you will find your balance point. Let us know what you are doing in the comments below. I agree! I’ve done this and it helps A LOT! I would just write down what I ate, not how much or how many calories, and right next to it I would write what I was feleing. Now I just write my feleings in my journal, and that is so helpful in releasing them, whether I’m depressed, angry, happy, or whatever. Journaling has really helped me figure out what’s going on inside me and why I binge or overeat. Thanks for sharing this with everyone!